These cat ties make a great addition to a cat lover's wardrobe. These cat ties are 100% polyester, dry cleaning recommended. The design on the left is called Cat And Mouse. It has a navy blue background. The design on the right is called Many Cats. 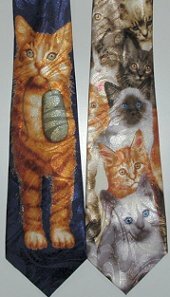 The cat images fill the entire length of the tie.